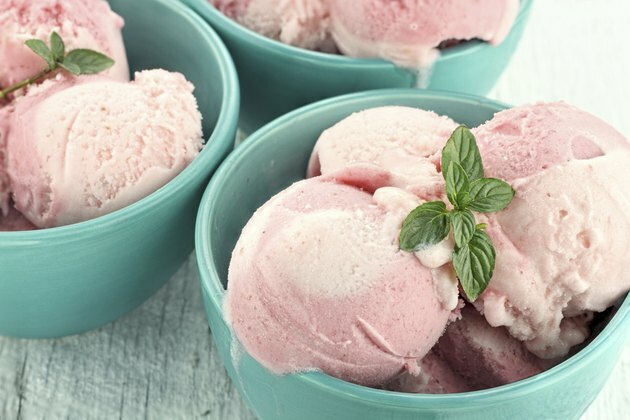 If you develop loose, watery stools after eating ice cream, you may be lactose intolerant, have a milk allergy or have irritable bowel syndrome. Ice cream is made from milk and contains lactose, which can trigger diarrhea if you have one or more of these conditions. Avoid eating ice cream if you develop diarrhea until you can be seen by your doctor and receive a clinical diagnosis. If you notice blood in your diarrhea, call your doctor immediately because this may be a sign of a more serious condition. If you're lactose intolerant, you will most likely develop diarrhea from eating ice cream. How intolerant you are of lactose and how much ice cream you eat will determine the severity of the diarrhea and other gastric symptoms. Lactose is sugar found in milk products. If you're lactose intolerant, you are deficient in a certain enzyme, lactase, that helps to digest the lactose. Without lactase, the lactose remains undigested in your gut and enters your colon, where it interacts with bacteria. This causes excessive gas, bloating, stomach pain, cramping and diarrhea. Diarrhea can be prevented when you eat ice cream by taking a lactase supplement before your first bite of ice cream. Diarrhea can form within minutes of eating ice cream if you have a milk allergy. Milk allergies are one of the most common food allergies that primarily affects young children. Although diarrhea is a primary symptom of a milk allergy from eating ice cream, you will develop other symptoms aside from the digestive system. A milk allergy can cause rashes, hives, eczema, sinus congestion, wheezing, difficulty breathing, chest tightness, shortness of breath and swelling in the face. An allergic reaction to milk is caused by an exaggerated immune system response to the presence of milk proteins. Irritable bowel syndrome, or IBS, causes chronic diarrhea or constipation after eating certain foods. Dairy products are common food triggers for IBS symptoms. IBS is a common condition, affecting about one-fourth of the American population, according to the National Digestive Diseases Information Clearinghouse. If you notice that you develop diarrhea after consistently after eating, talk with your doctor about being tested for IBS. Diarrhea that results from eating ice cream and other dairy products may be most effectively treated by avoiding dairy. Dairy may be found in unlikely places, such as in deli meats, salad dressings and sauces.